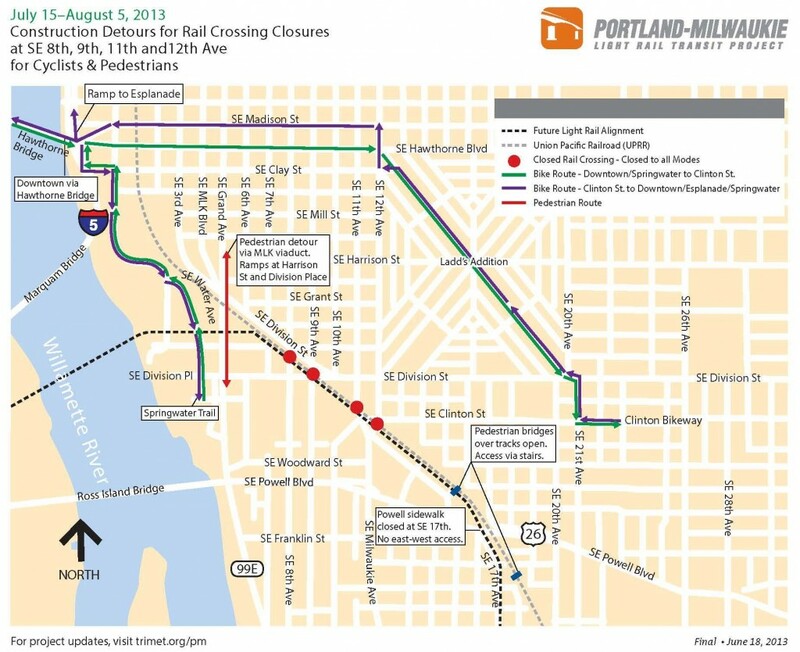 Portland-Milwaukie Light Rail Transit Project construction will require temporary road closures and detours where SE 8th, 11th and 12th avenues cross existing railroad tracks and the future light rail alignment. Working simultaneously at the three nearby crossings south of Division Street and much of it around the clock shortens the duration of the street closures. The crossings will be closed starting at 7 a.m. on Monday, July 15 and continuing to 5 a.m. on Monday, August 5. Motor vehicles detours pass over the rail tracks to the west of the closed crossings, largely via SE Martin Luther King Avenue and Grand Avenue. Cyclists should proceed north of the crossings to follow Hawthorne Boulevard to and from the Central Eastside and downtown Portland. Construction crews will complete installation of light rail tracks at the crossings, and this period of construction will also result in safety improvements to the rail crossings that will allow the City of Portland to apply for a quiet zone. In a quiet zone, freight and light rail train horns will only sound if there is an immediate safety issue. Once approved and all safety measures are in place, the quiet zone operation would go into effect prior to the start of light rail train service in September 2015. 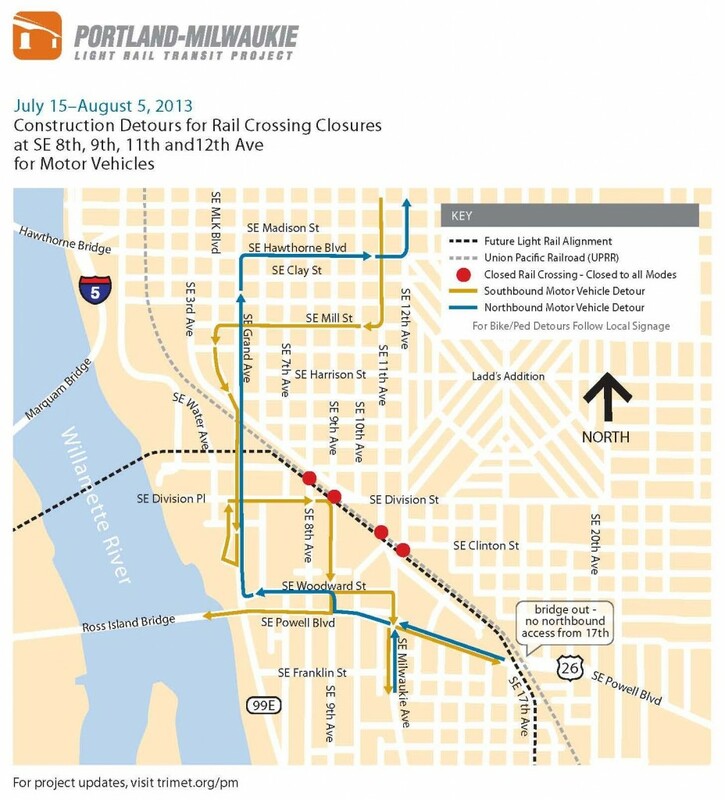 Crews will also continue work on adjacent improvements to cyclist and pedestrian facilities that will create continuous routes from the east end of the multi-use path on the Portland-Milwaukie Light Rail Bridge and the east bank of the Willamette River to the Clinton/SE 12th Ave Max Station and the Hosford-Abernethy neighborhood. These improvements will be completed as the project work progresses over the next year.